Teti, 1st king of the 6th dynasty ruled Egypt for some 32 years. The 6th dynasty is considered a period of decline and indeed the Old Kingdom ended with the 6th dynasty after the 92 year reign of Pepi II. Teti chose an area in Central Saqqara just south of the 1st dynasty mastabas and northeast of Userkaf's pyramid. Teti's pyramid follows a diagonal formed by the pyramids of Sekhemkhet, Unas, Djoser and Userkaf. There is some evidence from the nearby mastabas that Teti may come to the throne in unusual circumstances. The pyramid can be entered and has extremely beautiful high relief in the subterranean chambers. It contains a basalt sarcophagus in a pented vault with stars on the ceiling. There are three pyramids in the immediate area. The Ba pyramid on the southeast side. The Queens pyramids of Iput mother of Pepi I, and Khuit located just north of Teti's pyramid next to the mastaba of Ankhmahor. In this scene the pyramid of Teti is seen in the background to the left. In the right background is the Step Pyramid with the the pyramid of Userkaf just in front of it.. 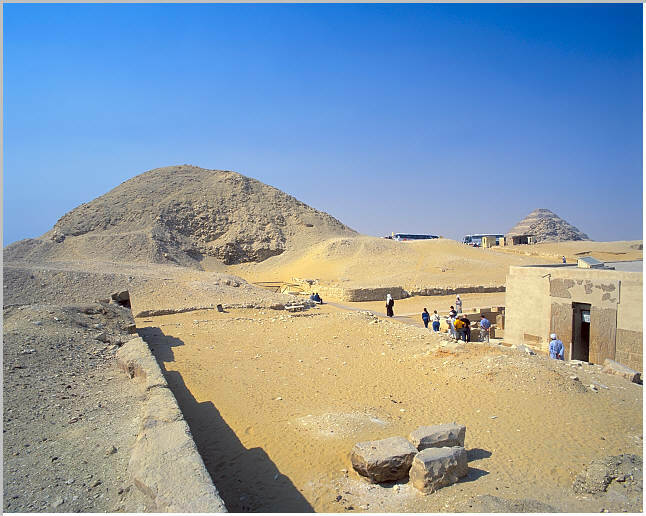 The beautiful mastaba of Kagemni is visible just to the center right.